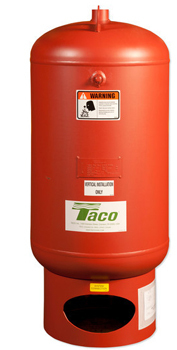 Taco CBX Expansion Tanks are bladder type tanks that provide permanent separation of air and water. Designed for use in hydronic systems and non-potable, hydro-pneumatic and drawn down applications, they are tough, durable, long-lasting and come in a variety of sizes and capacities to fit your application. They feature a removable heavy-duty Butyl rubber bladder, fabricated steel shell designed and constructed per ASME Section VIII Div 1. Each is factory pre-charged to job specifications. Standard bladder: 125 PSIG (862 kPa). Optional bladder: 150 PSIG (1,034 kPa).